The nearby statue commemorates the generations of Portsea children who enjoyed mudlarking here - entertaining travellers by retrieving coins they threw into the mud below the bridge to the harbour station and Gosport Ferry. 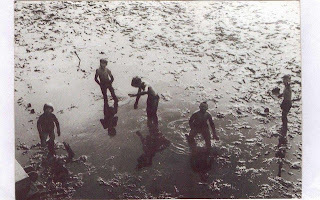 Boys and girls would scramble to find the money tossed down, sometimes diving into the mud, performing handstands or dipping their heads in it. Many Portsea families lived in poverty, so the small change was welcomed. Usually, what the children did not spend on sweets or pie and chips was given to mum to help out the family finances. 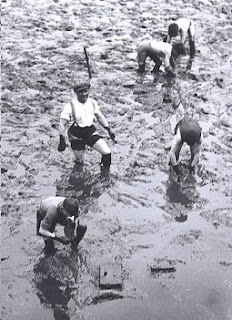 Most parents disapproved of their children's activities, while the police regarded mudlarking as begging and tried to stop it. Mudlarking supplemented other ways of earning a few shillings, such as carrying passengers' bags or finding drivers parking spaces. The building of the new bus terminus in 1976-7 put an end to mudlarking. Plus, did you know that the Pompey accent isn’t far off from Cockney? People’s stories from online have people remembering mudlarks saying things like: “Bung us a bob matlow [Give me a shilling, sailor]”, and “Dip me ‘ead for a sparsy [possibly a sixpence]”. Helpfully, Sedden includes a brief explanation of old money so the readers know what the mudlarks are referring to - see the picture. I was going to try and put old money in context but it appears to be impossible, so if you're interested, this page gives a brilliant explanation of everything. To conclude my little mudlarking history lesson (tee hee! 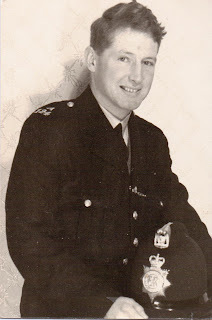 ), I thought I'd mention my grandpa again. I've already mentioned that he was a policeman in the 1950s and 60s, and that he and my grandma brought my attention to the mudlarks. Poppa told me that he was always reluctant to head over to The Hard whenever he was told to move the mudlarks along (as they were considered beggars) - they were only trying to make a living, after all. This picture here is him in his police uniform - I love it! UPDATE: I sent my grandpa his own copy of the book, and he finished it in a day, saying it was delightfully over the top. My grandma is currently reading it. So there we go - a book for all ages! I am 67 and an old mudlarker, what has been written, is as it was, but in my day it was mostly sailors that cast down the money, read my melvynsmudlaringinpompy blobspot, to know my story?. Sorry for the late reply, but thank you for your comment! Unfortunately I can't find your blog but I'd be really interested to learn more about mudlarking - would you mind posting the link somewhere please?